It has been a couple of weeks since my last post and during that time I've only ventured out on a couple occasions, once to take a look at a male Red-crested Pochard (151) that was seen by Graham James early in the morning at the Water Colour Lagoons on July 6th, and the other was an afternoon walk with Annie, on one of those rare moments when the sun was out, at Cuckmere down on the coast. 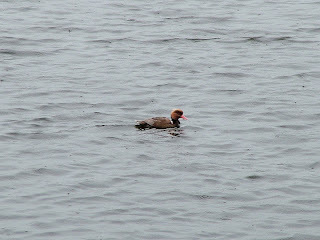 The Red-crested Pochard is a bird of debate locally because of the history of the species in the area. I wrote about them in a previous blog post (http://randonsramblings.blogspot.co.uk/2011/02/judging-bird-by-its-feathers.html). 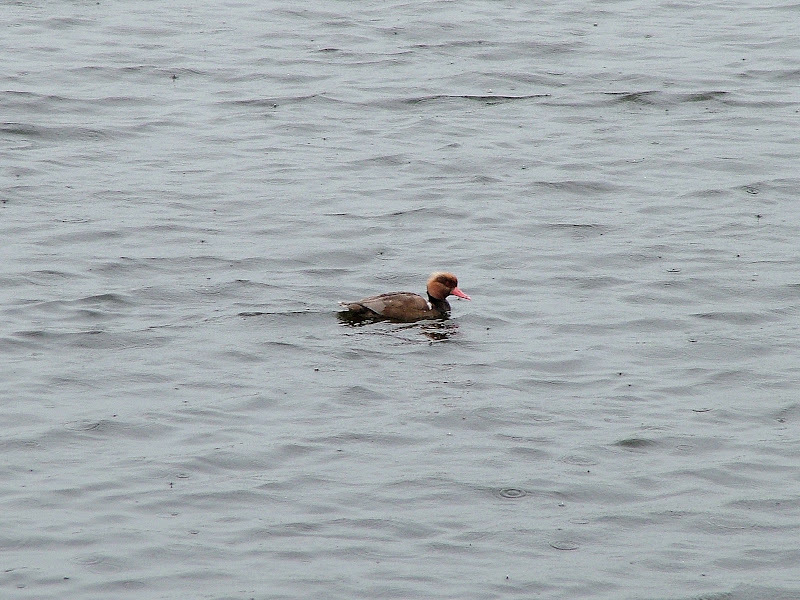 On Frenches Pond, just off Frenches Road, six Red-crested Pochards used to hang about there – five males and a female. They had originally had their wings clipped, along with a Mandarin and a Pintail but once the management of the pond ended due to lack of funds, the birds wings grew back and eventually they were able to fly off. 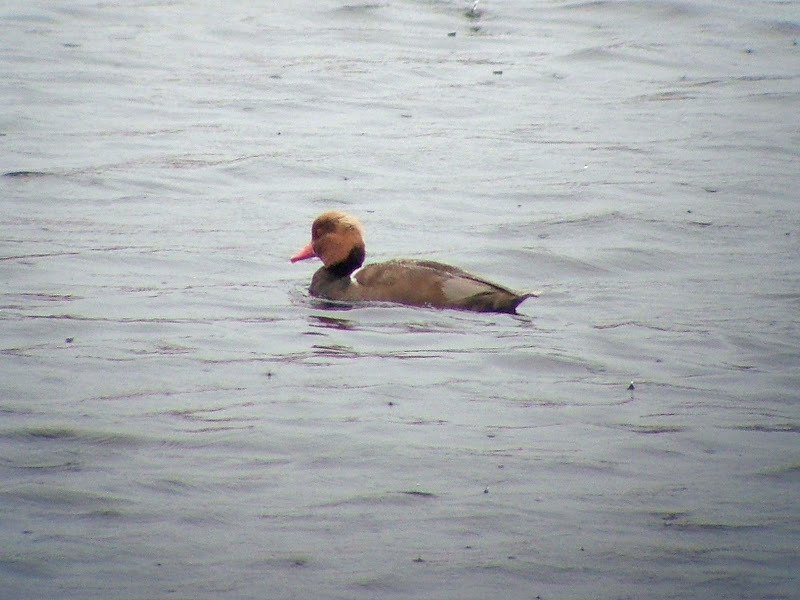 This obviously opens up the discussion at to whether the Red-crested Pochard seen last week was an escapee or a genuine wild bird. Some think it is of doubtful origin, but I disagree. I don't have much to go on, only that this particular bird was relatively shy and wary of people – whenever you tried to get a closer view it would swim away. It always kept a distance. Holmethorpe hasn't had a visit from one of these birds in some time – we've not had a Mandarin either, although I saw two in a flooded field along Rocky Lane some months back. The fact there have been clipped birds nearby in the past doesn't automatically mean any future visitors are escapees. There's little way of knowing apart from possibly watching the bird's behaviour. If it stuck close to the edge of the lagoon as though expecting food you would automatically be suspicious, but this bird keeps to itself and away from people. Whatever, I'm counted it! A bird that could never been accused of being an escapee is a Red-backed Shrike. When one turns up within striking distance from home it has to be seen. 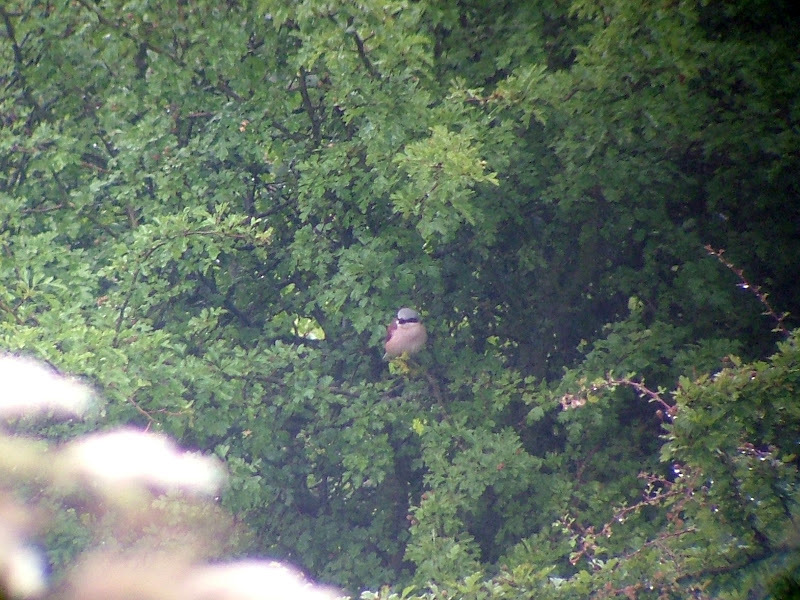 I've not had much luck with Red-backed Shrikes in the past. I missed the last two to be seen in Surrey – both males – two years ago at Woodmansterne and Richmond Park and I was in danger of not seeing this one, another male, discovered by local birding guru Pete Naylor at Lake Farm Country Park, near Hayes. Pete only lives ten minutes away from the site, and he was walking the patch on Wednesday morning when a bird flew up close by in a bush near the path. Once it turned its head he immediately recognised the distinctive black mask over the eyes of a male Red-backed Shrike. A brilliant find, particularly as Red-backed Shrikes at this time of year are usually females or juveniles. This small area of scrub is great habitat for migrant birds. A Wryneck was seen here last year and Wheatear and Whinchat are regular visitors. The problem with all migrant sightings is they don't usually stick around for long. I've had a few badly timed trips organised recently where I've been unable to hot-foot it to see an unusual bird because of other commitments and when eventually having a spare morning or afternoon free the bird has flown off during the night. A couple of recent frustrating examples are fairly typical. The first was the Sabine's Gull that was present at Startop's End Reservoir in Hertfordshire and showing fantastically well from July 1st to 5th, but was not seen again from July 6th – the day I had ear-marked to pay a visit – and the second was the Spoonbill that had originally been at Rainham Marshes for a week before settling at the WWT Centre at Barnes on Thursday and most of yesterday. It then flew off in the evening. I also failed to find a free day to go and see the three White Storks in West Sussex and still haven't managed to organise a date to go and see the Glossy Ibis in the Pagham Harbour area. 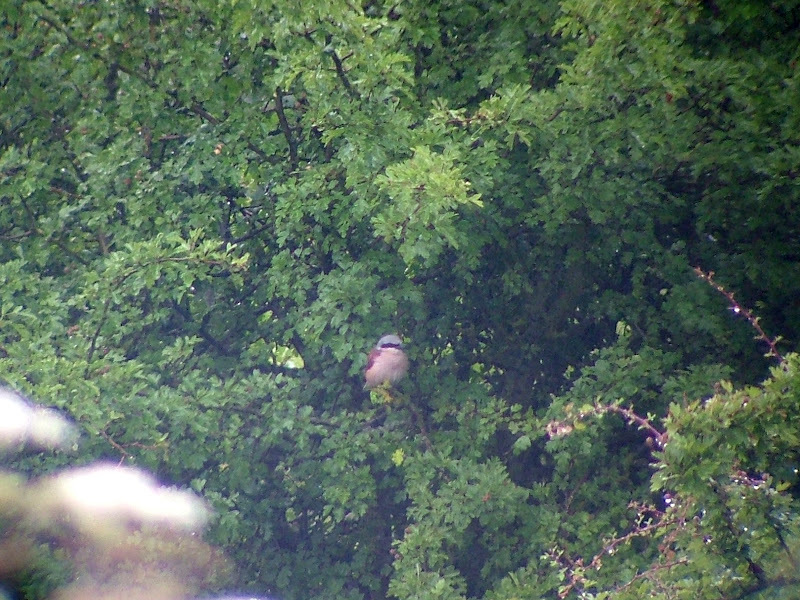 Fortunately, the Red-backed Shrike was seen again early this morning for a fourth day by Neville Smith up until 8.00am, so it was still worth a 45-minute trip around the M25 to Hayes. I didn't want to hang about because there was still a risk it might fly off at any given moment. I arrived at 10.45am just as it started to rain. I shouldn't have been surprised by that, and I also shouldn't have been surprised to learn that the bird had been showing well for ten minutes before flying into a bush just 15 minutes before I arrived. It had apparently been quite flighty and elusive prior to that. So it was a case of watching and waiting. 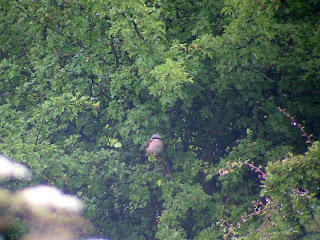 And in the end it paid off as the Red-backed Shrike reappeared after a half-an-hour wait perched low down in a bush for a few minutes poised to pounce on an unsuspecting insect. Such a striking bird, with its 'mask of Zorro' black band across its eyes, it eventually dropped out of view before flying low across the scrub and into a small tree and out of sight. There were only four of us watching at this point. A number of birders began to arrive ten minutes later, including local birder Ken Purdey, who'd seen it on Thursday, Pete Naylor, and also Sutton birder Paul Cox. 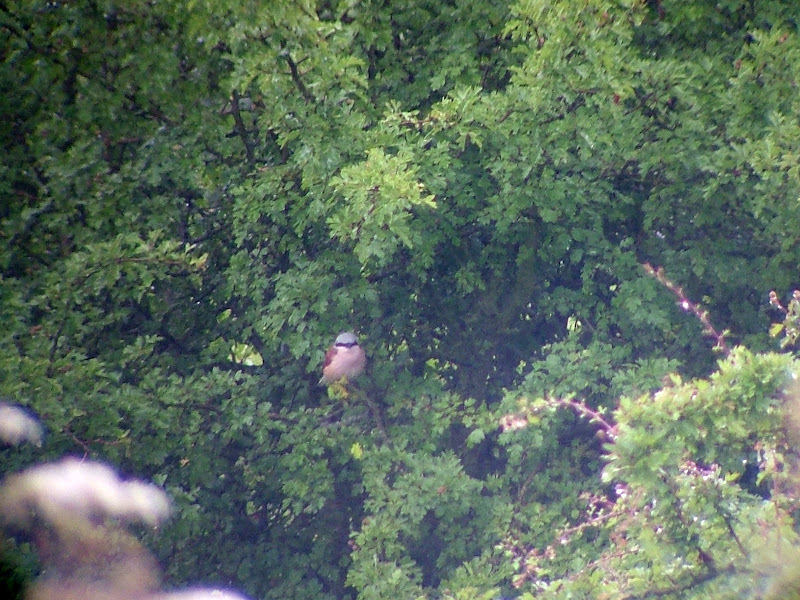 I waited for at least another 90 minutes for another view of this magnificent Shrike but there was no sign. I had work to do in the afternoon so I headed home. It did reappear further along the park, but that was at around 5.40pm, so my luck had been in for once.